Three weeks after meeting its $725,000 goal, Massive Chalice is officially funded. 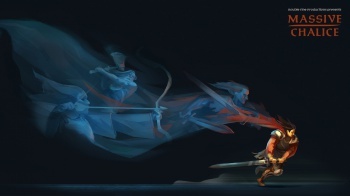 Double Fine's second Kickstarter campaign closed today, meaning that Massive Chalice is now officially funded. The campaign for the tactical strategy game from the developer behind Psychonauts and Brutal Legend began about a month ago, and eager fans helped it meet its $750,000 goal in under a week. More than 31,000 people contributed to the total of $1,229,015. Tim Schafer's studio is no stranger to Kickstarter, of course, having used the service to successfully fund Broken Age (then called Double Fine Adventure) early last year. While that campaign was a runaway success beyond Schafer's expectations, Massive Chalice's total was just a humble $500,000 or so over the game's original goal. That might mean we'll see the game on non-PC platforms, according to the Kickstarter's FAQ, but there have been no promises. It's easy to complain about well-known or established developers turning to Kickstarter to fund their projects, but for studios like Double Fine that have always struggled to make things work with publishers, it's a great opportunity to do something refreshing and different. Hopefully it pays off for Double Fine and its backers in the form of a great game.